Cemlyn Jones Room (PL2), Pontio, Bangor University's Arts and Innovation Centre, Deiniol Road, Bangor, LL57 2TQ. We are sorry to announce that tonight’s talk in Pontio, Bangor, by Dr Toby Driver at 5pm has been cancelled due to a sudden family bereavement. A new date for this talk will be announced as soon as possible. All tickets will be valid for the rearranged lecture. The Royal Commission Christmas Lecture hosted by the School of History, Philosophy and Social Sciences, Bangor University. 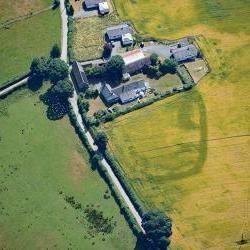 A Summer of Discovery in Wales: Aerial Archaeology and the Remarkable Heatwave of 2018 - Bangor by Dr Toby Driver. In response to popular demand, there is now an opportunity to attend the Royal Commission Christmas Lecture in Bangor, north Wales. Join Toby Driver for a stunning aerial journey across the parched fields of Wales during June and July 2018, when scores of newly-identified archaeological sites showed up as cropmarks and parchmarks. The talk will look at major cropmark discoveries from across Wales and discuss their significance, including a number of sites which have not been seen publicly before. The talk will also look at the enormous media interest which followed the discoveries, where Welsh cropmarks appeared alongside world events on the website of the New York Post.